Canadian Forest Products is applying a comprehensive, company-wide approach to the challenges surrounding sawdust and ignition source management within its family of sawmills and wood processing plants, an approach that emphasizes good communication and co-operation between all its employees. As one of North America’s largest integrated forest companies, Canfor has also taken a leadership role in helping develop a tool to assist other sawmills more efficiently deal with sawdust accumulations and keep their operations safer. The new sawdust audit standard tool is freely available to all sawmills and wood manufacturing plants, regardless of size. The sawdust management issue came under increased scrutiny following two tragic explosions and fires at sawmills in the British Columbia Interior. In January 2012, an explosion and fire destroyed Babine Forest Products’ sawmill near Burns Lake. Four months later, a similar incident devastated Lakeland Mills in Prince George. Between them, the incidents cost four sawmill workers their lives and injured dozens more. Sawdust and wood debris accumulations in the stricken mills are suspected of being at least contributory factors in the explosions. The official causes of the incidents remained under investigation at press time. 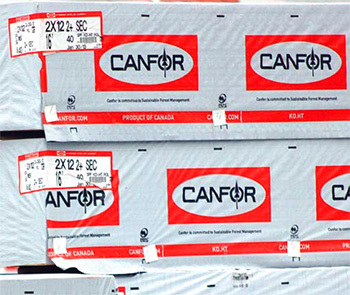 Canfor’s internal response to the sawmill explosions and fires has been both prompt and pro-active, said Ross Lennox, Canfor’s manager of wood products safety. The specific creation of Lennox’s job reflects Canfor’s concerns about wood dust accumulations and potential ignition sources within the company’s mills. “Part of creating this role is to co-ordinate management across Canfor operations, to share best practices between mills and liaise with regulatory agencies while driving a strategic safety improvement program,” summarized Lennox. Lennox has been with Canfor for about 14 years, is a Registered Professional Forester but also has first-hand experience of the manufacturing and quality control sides of the business. 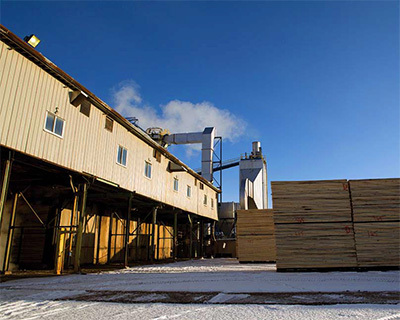 Canfor has completed a series of facility risk assessments, which took the form of a comprehensive tour of every company sawmill, planer and energy plant. The assessments were made by a cross section of employees, delivering differing skillsets to the process and included facility insurers to provide engineering expertise. In the days following the Lakeland Mill explosion and fire, Canfor’s activities kicked into higher gear. “We brought a team of employees together to review and reinforce our wood dust management strategy. This started with an enhanced level of communication, particularly with our hourly employees in our B.C. and Alberta sawmills,” he recalled. Canfor also completed a series of facility risk assessments. They took the form of a comprehensive tour of every company sawmill, planer and energy plant. The assessments were made by a cross section of employees, delivering differing skillsets to the process and included facility insurers to provide engineering expertise, continued Lennox. 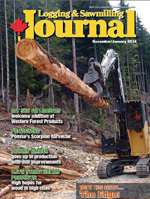 Canfor developed and implemented a wood dust control program in all of its B.C. and Alberta mills using input from hourly and staff employees as well as technical experts. Employee training around dust issues—with a specific new employee component—hazard and risk assessments and process controls are all part of a wood dust control program. An internal review process delivers day-to-day feedback on wood dust levels in sawmills allowing for a broader management perspective of the issues, added Lennox. “The overall focus has been to capture dust at the location it is created so in the long term it can help us be more efficient with its management.” Lennox said mill improvement projects have included new cyclone and bag house extraction systems. The primary breakdown process has been a focus in mills along with associated conveyor transfer systems and chip screen areas. “Capital improvements generally have been focused on extraction and getting dust out of the mill,” he summarized. In addition to any major capital improvements, all of Canfor’s mills are looking at a host of smaller measures that make sense for that specific operation. “The industry has learned there is no one tool that’s perfect in every application,” says Lennox. When Don Kayne, Canfor CEO and president, was instrumental with the creation of the new sawdust audit standard with fellow-minded forest company CEOs, they used the Manufacturers Advisory Group (MAG) to drive their endeavours through an industry task force. The MAG was a pre-existing group of forest company safety experts. Lennox cited three key accomplishments to emerge from the work of the CEO task force. One was a task force-sanctioned FPInnovations study which provided a better understanding of wood dust and its behaviours, said Lennox. The comprehensive dust audit was another major accomplishment and is now being systematically introduced into Canfor’s mills. Thirdly, is education and training material that is being developed for the broader industry on the topics of combustible dust and ignition sources. The Fire Inspection and Prevention Initiative has been a valuable partner in the development of this training material, he said. “The level of co-operation, including from labour, was very positive in addressing the issues and we can build on those relationships,” he noted.